Valencia Bay, Lot 109. Builder new construction quick delivery home with Impact glass windows. June/July occupancy. 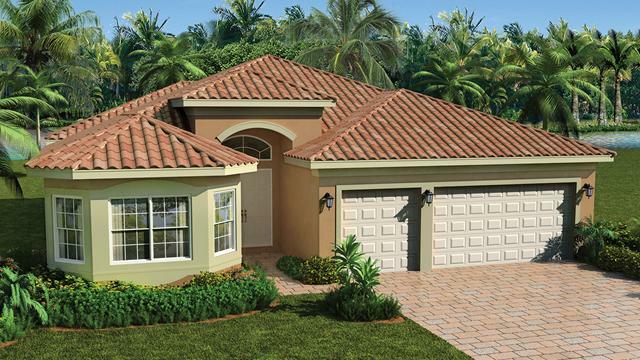 Price includes 64,000 in builder upgrades and $8,000 lot premium. Upgrades include additional recessed lights, 24x24 Beige polished rectified tile floors, Snow White granite countertops in the kitchen, with Frosty White Soho Maple cabinets and a glass tile backsplash. The master bath includes Taj Royal Ceasarstone quartz countertops and Frosty White Lexington Maple cabinets. Vignette package includes custom paint, window treatments and ceiling fans. Elevation includes Transitional style roof. Call for a full list of upgrades. Additional closing cost incentives may apply. Incentives may change at any time. Note: All photos are artist renderings.